Word 8742. Give Them All to Jesus. 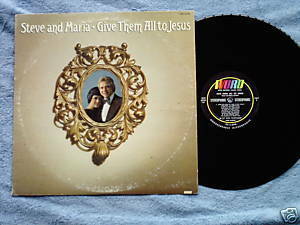 Steve and Maria Gardner (1977) LP. Tracks include I Love You Lord, He Looked Beyond My Faults, Maybe If I Try, MEDLEY: Holy Holy Holy and Holy Holy. Produced by Buddy Hey. Steve and Maria are accompanied by Chicago Singers Unlimited. Cover design by Charles Wallace, Inc--Ron Beverly. Vinyl is VG; cover with photos is VG with ring wear and seam scuffing.